Railroad detective Matt Clark (Jim Davis) and his attractive assistants Frankie Adams (Mary Castle) and later Margaret Jones (Kristine Miller) tracks down the most notorious outlaws of the Old West. Over the course of 39 episodes he succeeds in capturing the likes of Billy the Kid, Jesse James, Geronimo, and Doc Holliday. While the timing of the years was not quite accurate (the outlaws that they pursued during one year of the series covered a historical period of 40 years), each episode followed the basic historical facts, which were gleaned from newspapers and other written records. 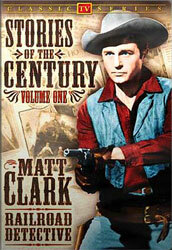 The show only ran for two seasons, but it was the first western TV series to win an Emmy award (Best Western or Adventure series – 1954). William Witney directed 30 of the 39 episodes. He also directed 22 episodes of the TV Western, Bonanza. Maurice Tombragel was screenwriter for 21 episodes. He also was screenwriter for 28 episodes of The Wonderful World of Disney.